Comprehensive review of Nature’s Bounty Healthy Mom Prenatal Multi. See what real experts and actual users have to say about this prenatal vitamin. If you’re an expectant mother on a budget who doesn’t want to sacrifice quality for an affordable price tag, then Nature’s Bounty Healthy Mom Prenatal Multi is the prenatal vitamin for you! These prenatal vitamins are super easy to take, and just require swallowing two small softgels with a meal daily. Costing less than $9 for a 30-day supply, most everyone can both afford this vitamin and find time to take them in their busy schedules! Aside from the ease of use, the ingredient list for this prenatal multivitamin is impressive. It does leave off two important vitamins, but beyond that, it has everything you need to keep you and your baby healthy during pregnancy! Nature’s Bounty Healthy Mom Prenatal Multi should be on everyone’s radar, regardless of what your price point is, if you’re looking for an easy vitamin to take, and one that has everything you need to sustain a healthy pregnancy! Nature’s Bounty Healthy Mom Prenatal vitamins are super easy to take! You simply take two softgels daily, preferably with a meal. The pills are really easy to swallow, too. They aren’t very large, and they have a smooth plastic coating on them, so I had no problem swallowing them both at the same time. I always take my prenatal vitamins with breakfast each morning, so it was easy for me to follow the directions of taking the prenatals with a meal. Doing it this way prevented me from having an upset stomach too, so it’s definitely worth it to follow the instructions! Nature’s Bounty Healthy Mom Prenatal vitamins are completely tasteless! Sometimes even prenatal vitamins in plastic coating can have a gross vitamin taste to them, even for the brief moment they’re in your mouth before swallowing, but these don’t at all! This is a total plus because unless it’s a flavored gummy, most vitamins taste pretty nasty. I also didn’t have any gross burps later on in the day, so I would definitely categorize these as tasteless! Major win! With just how insanely cheap Nature’s Bounty Healthy Mom Prenatal Multi vitamins are, I was super skeptical before analyzing the ingredients. How the heck could a vitamin be this affordable and actually contain everything you need to keep you and your baby healthy during pregnancy? After analyzing the ingredient list, however, I found that I’m really impressed with how much is in this vitamin, and found it to be a great option for expectant mothers! Before jumping into the bulk of the ingredients, I did want to point out that Nature’s Bounty Health Mom Prenatal Multi vitamins has 800 mcg of Folic Acid, which is the perfect amount in my opinion! Just make sure that you take note of the fact that it’s in the form of Folic Acid, not Folate, so if you need to take Folate specifically, this probably isn’t the best option for you. Some additional positives regarding the ingredient list of this prenatal multivitamin is that they have the right amount of Vitamin A, Thiamin-B1, Riboflavin-B2, Niacin-B3, Pyridoxine-B6, Biotin-B7, Vitamin B12, Vitamin C, Vitamin E, Vitamin D, Iron, and Zinc. It’s really low in Calcium, but that doesn’t really bother me. You can get Calcium from so many different sources, so I don’t fault prenatal vitamins too much when the Calcium is low. However, it’s also low in Iodine, which helps with brain and spinal cord development, so I wish that had the proper RDA! Unfortunately, Nature’s Bounty Healthy Mom Prenatal Multi doesn’t have any Vitamin K or Choline in it, which is such a bummer! As I’m sure you know, Choline plays a large role in cell specialization, regulating gene function, and the creation of organs, so it’s super important, as is Vitamin K! As a final note, Nature’s Bounty Healthy Mom Prenatal Multi does contain 200 mg of DHA, which is super exciting for me since many prenatal vitamins are leaving it off completely, and it’s so crucial to your baby’s brain development. However, that’s the only Omega-3s it does contain, and the RDA is somewhere around 650mg daily, so that was definitely a bummer for me after getting excited about the presence of DHA. You also need about 300 mg of your Omega-3s being from DHA, so sadly the dosage isn’t exactly right for that either. Overall, after analyzing the ingredient list, I’m super impressed! I think they do an awesome job at getting the majority of necessary ingredients in and at the right dosage, and I think at this price point, it’s an awesome choice for moms-to-be! I didn’t experience any negative side effects while taking this vitamin, so that’s a definite bonus! I absolutely think that Nature’s Bounty Healthy Mom Prenatal Multi is worth the money! I really can’t believe how affordable these prenatal vitamins are given how good the ingredient list is. The ingredient list, partnered with the ease of use and cheap price tag, makes these vitamins well worth the money you spend on them! You will need to buy an Omega-3 supplement in addition to this, but with how cheap the vitamins are, I think that’s totally reasonable. Nature’s Bounty sells their products through third-party retailers, such as Amazon. The return policy and money-back guarantees are dependent on the return policy of the individual retailers. 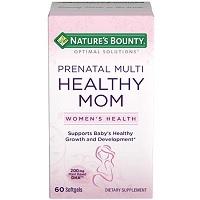 To buy Nature’s Bounty Healthy Mom Prenatal Multi, click here. Ease of Use Super easy; take two softgels daily with meal. Softgels were super easy to swallow, as well. The 10 Best Prenatal Vitamins For 2019! Do Prenatal Vitamins Help Hair Grow Faster? Can Prenatal Vitamins Help You Get Pregnant? Do Prenatals Make Your Hair Grow Faster? MATERIAL CONNECTION DISCLOSURE: You should assume that this website has an affiliate relationship and/or another material connection to the persons or businesses mentioned in or linked to from this page and may receive commissions from purchases you make on subsequent web sites. You should not rely solely on information contained on this website to evaluate the product or service being endorsed. Always exercise due diligence before purchasing any product or service. This website contains advertisements. FDA DISCLAIMER: The statements made on this website have not been evaluated by the Food and Drug Administration. These products are not intended to diagnose, treat, cure, or prevent any disease.